The price you found is 51% lower than this hotel's average rate of $353/night. The price you found is 23% lower than this hotel's average rate of $530/night. The price you found is 39% lower than this hotel's average rate of $291/night. The price you found is 10% lower than this hotel's average rate of $790/night. The price you found is 24% lower than this hotel's average rate of $733/night. The price you found is 46% lower than this hotel's average rate of $1,071/night. The price you found is 20% lower than this hotel's average rate of $633/night. The price you found is 60% lower than this hotel's average rate of $864/night. Ambition Suites is paradise, we could not recommend it highly enough. Iveta and the rest of the team were so friendly and helpful. 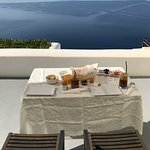 The setting was unbelievable - so private, with the best views, lovely breakfast made to order each morning on the terrace, only a few minute walk into Oia but when you were in the room and your private balcony you felt like you were the only 2 people on earth. We were very sad to leave, Ambition Suites and Oia are very special places. We stayed in the Emotion suite which was v. nice. They also provide free airport transfers which was a nice saving. 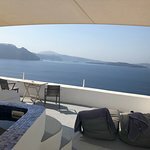 Compared to the most of the other accommodation in Santorini which is overlooked, this could not have been more perfect! 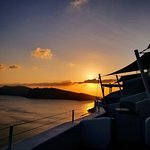 Best stay in Greece, couldn't have been better! This was our first stop to our 2 week honeymoon and it was amazing! 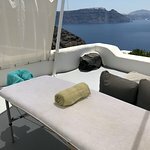 Oia does not offer many hotels with privacy but this one was the best for that. 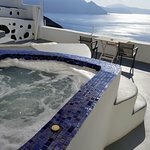 We had a hot tub outside over looking the caldera. There is room cleaning twice a day and hot tub was cleaned everyday as well. Hotel is in a good spot for excursion pick ups as well as late night options since it's the closest to the restaurant that's open the latest. The best part is the breakfast which is served at your desired time and what you want. It was usually pretty heavy that we only ate twice a day. Special service, off the beaten path at the end of town of oia, some other hotels not as private. Comfortable jacuzzi in every room, adjust the temperature to what you like. The jacuzzi cleaner is the best, oh he will also pick you up from airport/ferry very sweet cute guy!! Good value, what else??? Oh the view! Hope to return! Living in Dubai we do look for a big wow factor as we have so many amazing hotels. However the Ambition suites was a WOW! 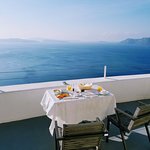 There are 4 suites at Ambition, built into the side of the Caldera and the view from these suites is absolutely stunning.... The suite itself is large with everything you would need along with the large outdoor area and hot tub jaccuzzi to top it off! Iveta was super helpful before we arrived and during our stay gave us an exceptional welcome and one of the best holidays ever, thank you for an exceptional holiday! 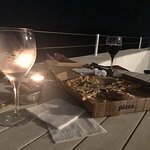 Ervetta was absolutely wonderful in helping us with restaurants and excursions. The view can not be beat! Everyone was so accommodating. Ambition Suites is on the Caldera side so the views are amazing; also the steps to the main strip Oia wasn’t too bad. Will stay again I hope! !